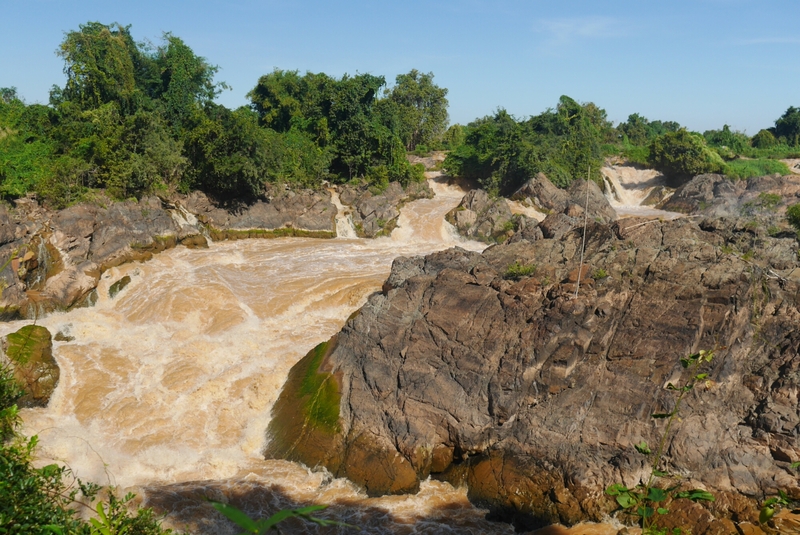 My goal for the day was to reach Stung Treng in Cambodia, but it’s only about 100 kilometers from Don Det so I spent the (relatively) cool morning hours exploring the islands. 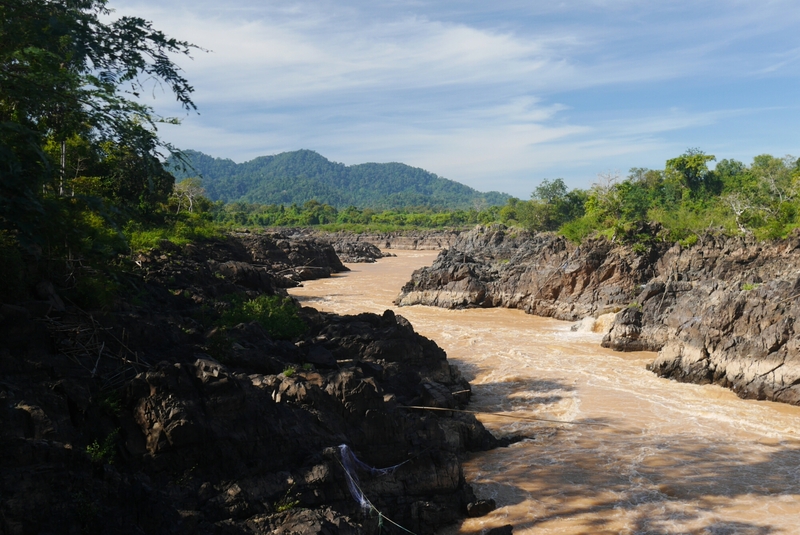 Close to Don Det is a slightly bigger island called Don Khon which is famous for two things, waterfalls and river dolphins. View from the bridge, who builds a house in such a tiny little island? 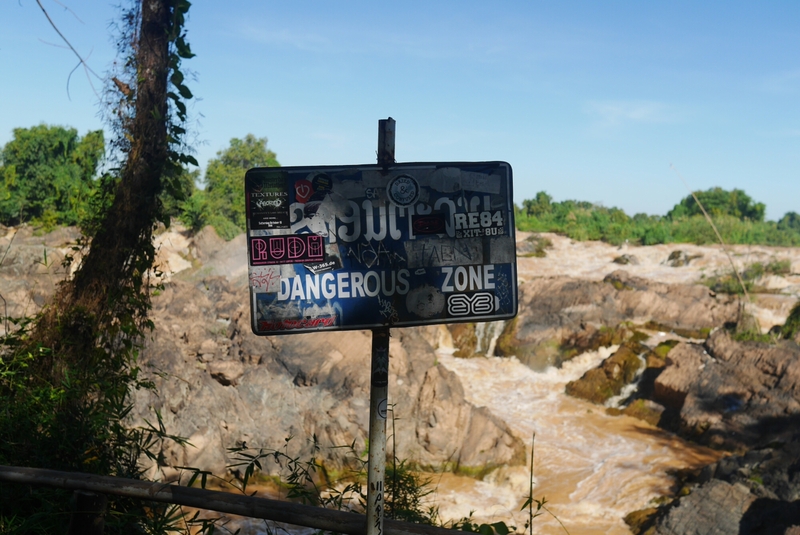 I took the motorbike along the little path that counts for a road in Don Det, crossed the bridge and went out to the biggest waterfall, Tad Somphamit. 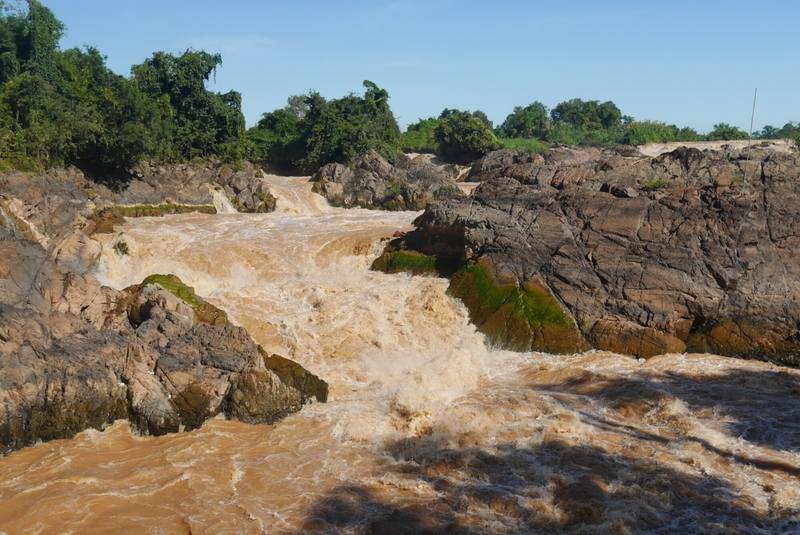 It is not tall and pristine like other falls I’ve seen here, but rather low and very wide, the brownish water of the Mekong cascading violently down the cliffs. The park from where you see it is on the opposite river bank and though there is a fence there are signs saying “dangerous zone” so you obviously don’t want to fall in to the churning waters. 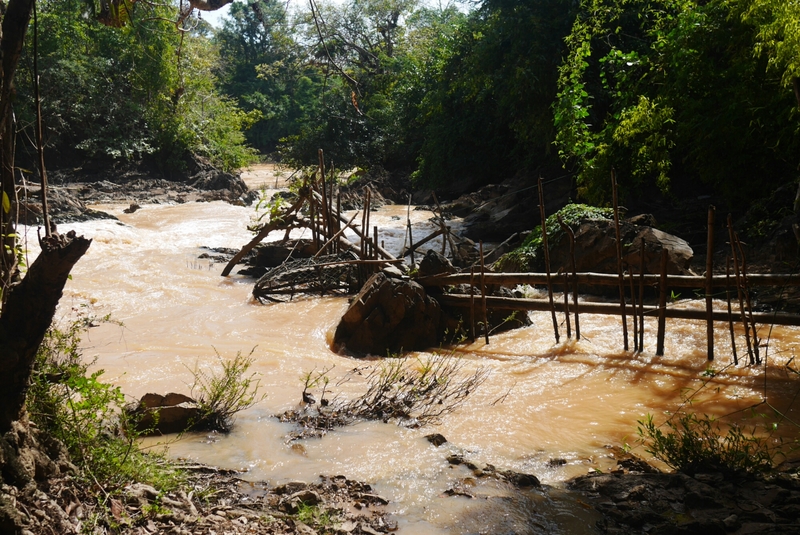 After seeing the main fall I kept walking and lo and behold, more, similar falls kept appearing. 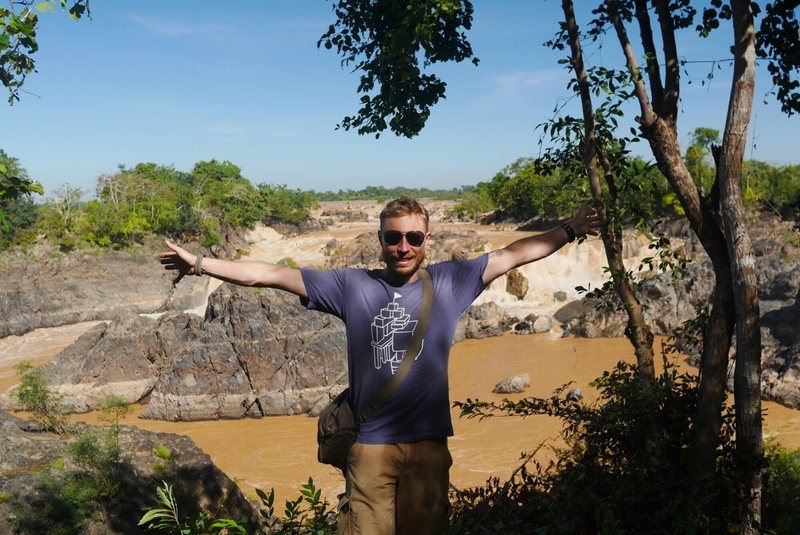 It’s like the entire Mekong went over a ledge. Some of the smaller falls. I continued southward along the little path. 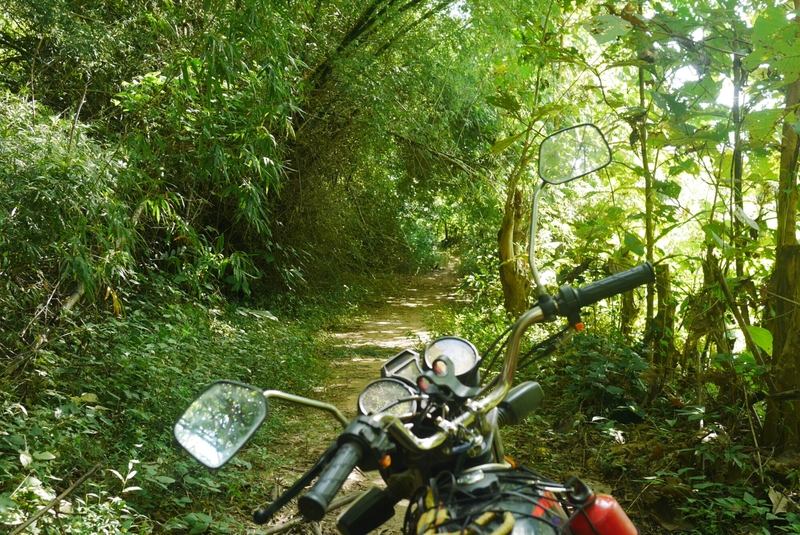 At some point I must have left the “main road” because I found myself on an even smaller path going through the jungle. According to the map it would lead to where I was going but after a while the forest became so thick I had to turn back. 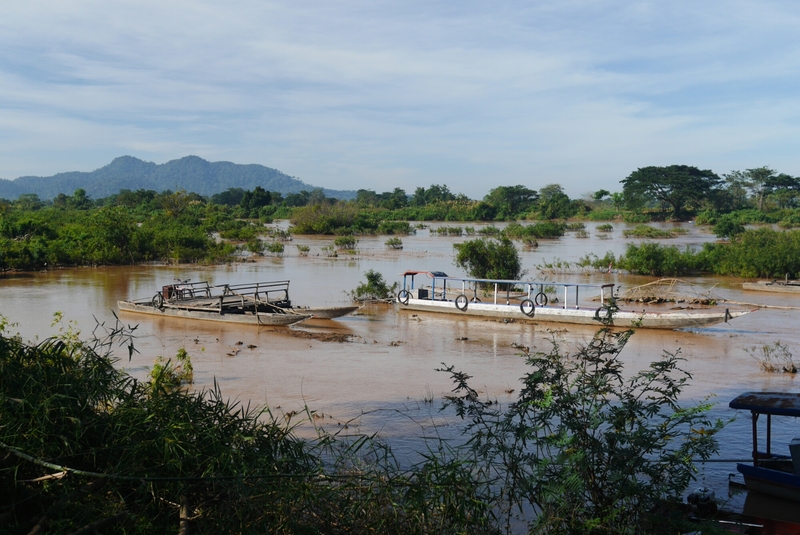 Eventually I reached point where you can go see the endangered irrawaddy dolphins. I’m not an animal lover and the chance for actually seeing some dolphins is not that great so I decided to skip the boat trip on offer. 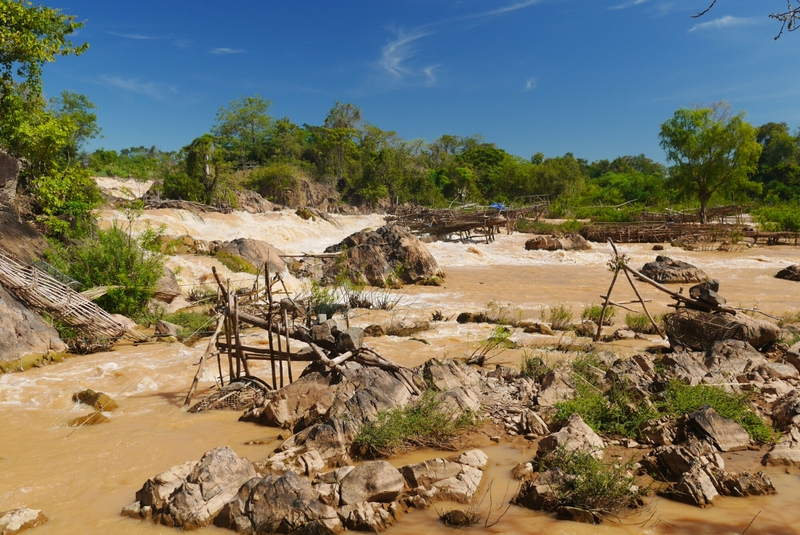 I headed back towards Don Det and right before the bridge I came to the remains of Laos only railway. 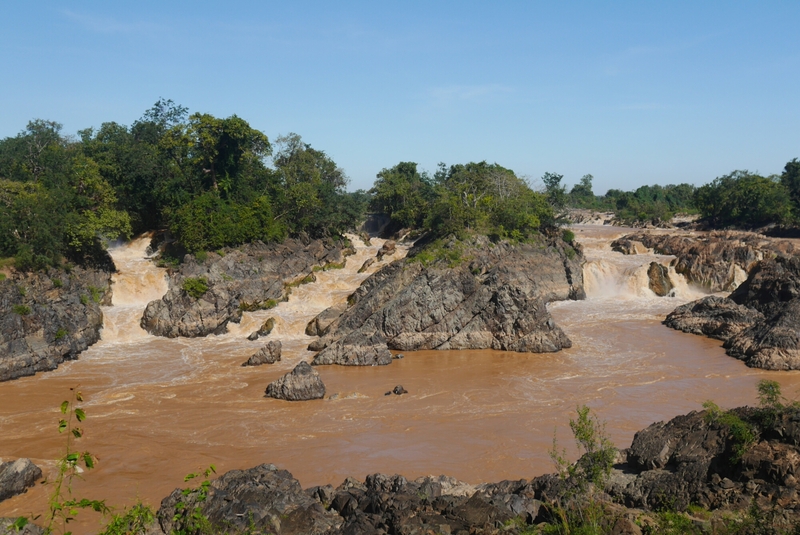 The falls make it impossible for boats to continue upstream but the French needed to get their gunboats up to Vientiane and Luang Prabang to better control their colonies. Their solution to the problem was to build a railway across the island so they could move ships over land up to calmer waters. 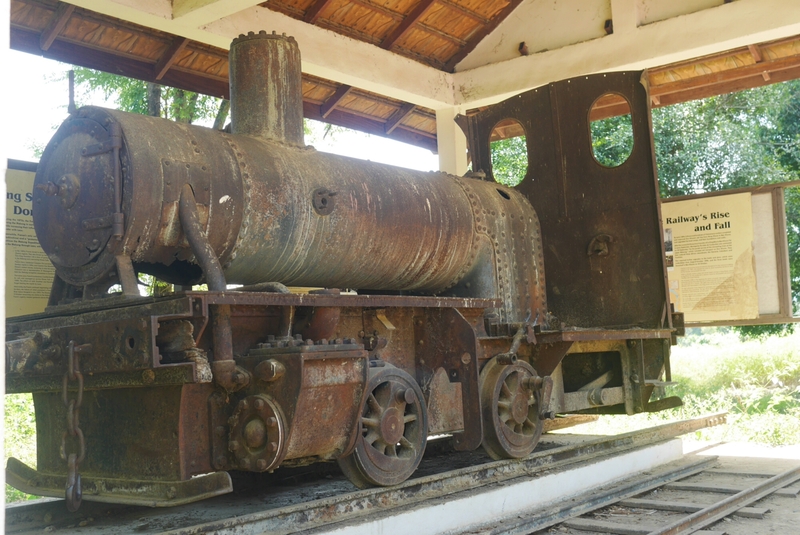 The railway was active form the late 1800s until the 1940s but has been abandoned since then. Some more riding got me to another waterfall but it was really just more of the same. 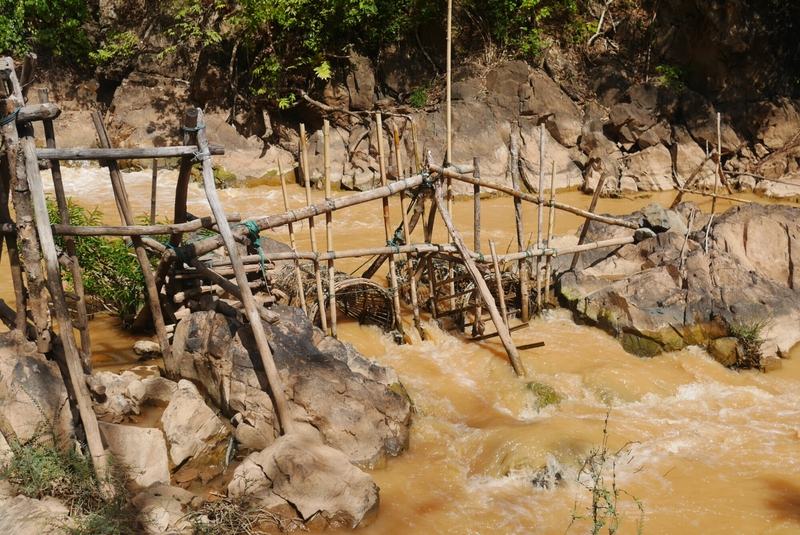 The only interesting thing about it is that the local people had set up a number of fish traps in the stream. I guess they yield a lot of fish but it must be scary as hell to bring in the catch. When I came back from my sightseeing tour I number into my French friends again who had just arrived. Since I wanted to leave for Cambodia we could only chat for a short while. I pointed them in the direction of a guesthouse, grabbed a quick lunch then set off. 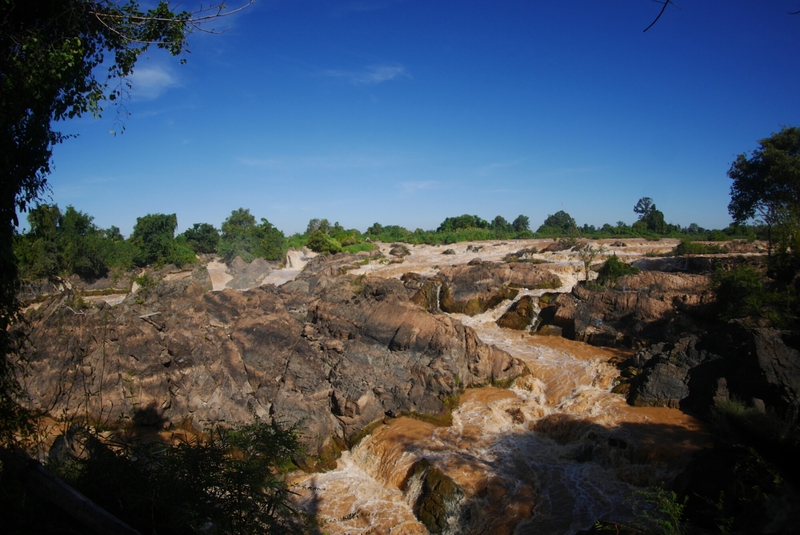 Information on the border crossing with Cambodia is extremely scarce and unreliable. 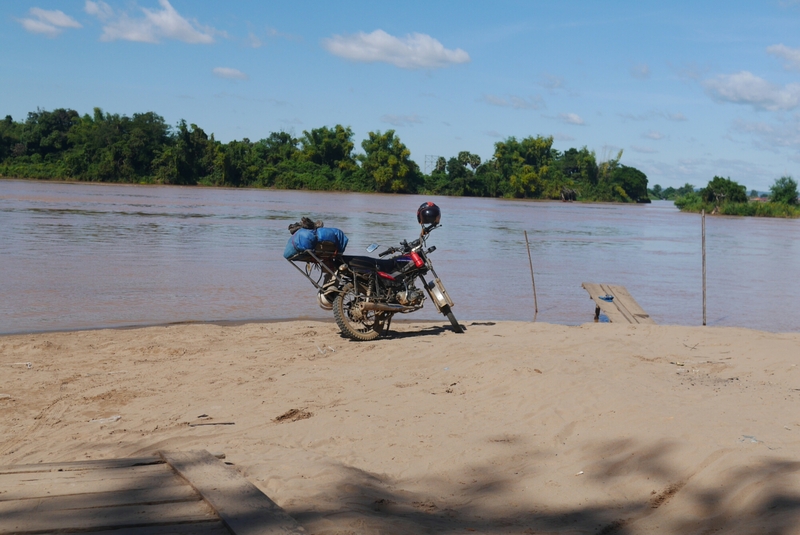 Some say its possible to cross, some say it’s not, some say there is a scam where you are let out of one country but not into the other and are forced to sell your motorbike at a low price if you want to continue. I also heard that the best way to do it is to hire a local to bring the bike across by boat, cross on your own by bus then pick up the bike later. However, I’m not the kind of person to engage in international bike smuggling on his vacation. Anyhow, there was seemingly no way to be sure, so I rode down to the border, hoping for the best but fearing the worst. 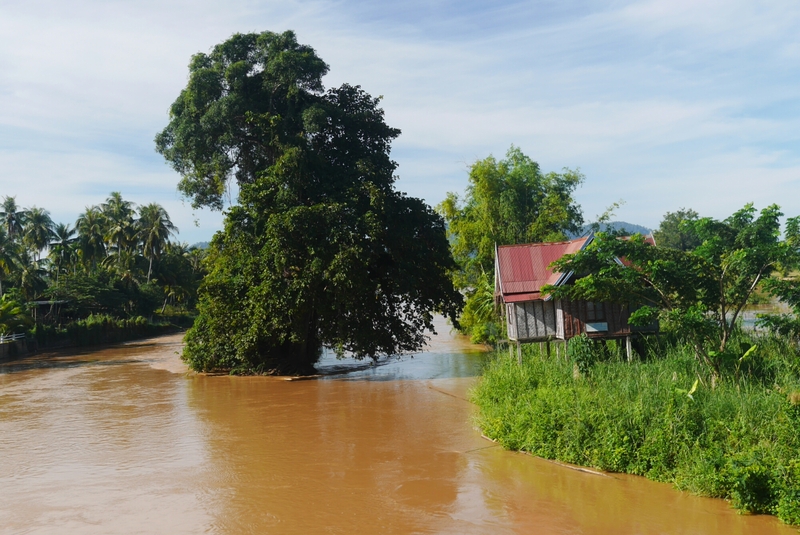 When I got there the Laotian border guard informed me that I couldn’t cross with the motorbike and that was the end of it. The obvious solution would be to take the bike back into Vietnam then cross to Cambodia from there. 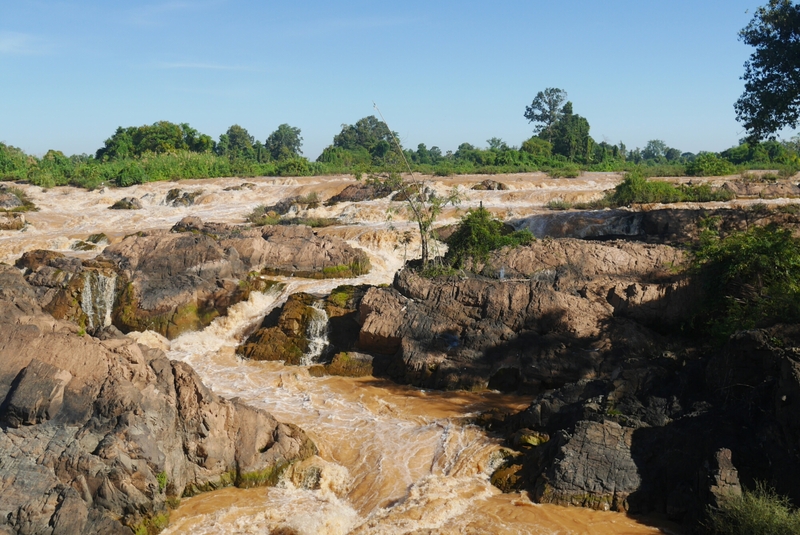 However, because of the 30 day rule for visa exempt entry into Vietnam, I had already exhausted that option when I crossed into Laos three weeks ago. So, with no other option, I headed back to Pakse. Now I just have to figure out another workaround.